It has been a long wait with a ridiculous amount of teases and false starts over the last four or five years, but Borderlands 3 was finally revealed at Gearbox’s PAX East 2019 panel (after more teases, of course). Are you ready to catch a ride!? Not too many details have been given yet about Borderlands 3 outside of the trailer above, but more information will arrive on April 3, 2019. What we do know, however, is that beloved characters from the series will be coming back, including Brick, Tiny Tina, and what seems to be an older Rhys from Telltale’s Tales from the Borderlands. 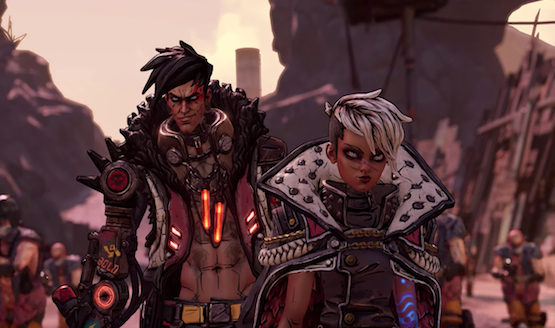 New characters will also join the cast of crazy new vault hunters, and the villains of the game look badass as they stroll alongside charging bandits with hair that will make you jealous. It also seems like we’ll be hunting in more places than just Pandora, as the trailer claims we’ll be exploring “worlds,” plural. Remind anyone of the Borderworlds rumors? A new vehicle was shown during the trailer as one character was riding on a wheel-like bike. Saws are also seen placed on top of the cars, hinting of new vehicular combat options being added to Borderlands 3. Weapons might be the most important aspect of the Borderlands series, and this sequel probably won’t disappoint. Gearbox loudly proclaims there will be over one billion weapons in the game, and in the trailer, they even show a gun with legs running in the battlefield. We briefly see a mech being activated too. Seems like Gearbox could be scaling up the mayhem, which may justify the long wait. During this jam-packed panel, the developer also announced that the original Borderlands: Game of the Year Edition will be coming to PS4, Xbox One, and PC next week on April 3rd, 2019. Plus, all of the DLC from Borderlands 2 will be available as a free addition to the PlayStation VR version this summer. And, if that’s not enough, Borderlands: The Handsome Collection will be getting a 4K upgrade on April 3rd for PS4 Pro with remastered environment textures, better weapon meshes and textures, re-encoded 4K cinematics, reworked anti-aliasing, and more. Are you excited to become a vault dweller once more? What are your hopes for Borderlands 3? Let us know!